We often hear the phrase “farm to table” but Kurt Timmermeister’s book , Growing a Feast, brings a whole new meaning to it. 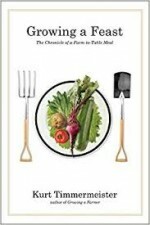 The author chronicles his two year experience from growing and harvesting food on his farm to cooking and serving an eight course gourmet meal with his produce to twenty of his friends. With experience as a restaurateur, a farmer, and finally a cheese maker, Timmermeister, writes from the premise that food should “ have a story, a pedigree, a tale to tell” and the result is a book full of amusing as well as informative anecdotes that reflect the author’s love for what he does. The story is set Vashon Island in the Pascific Norwest and begins with the birth of a calf but quickly moves to a detailed account of cheese making including the construction of a cheese cave. The narrative continues by following the many seasonal chores carried out by a typical small farmer including planting, tending and harvesting the garden, breeding and calving of a prize cow, and slaughtering the livestock. We learn about the dangers of bulls, long and short day onions, hauling of manure from the barns, and the pickling of currants. We meet farmhands, Jorge and Ben, the artificial insemination tech, Wayne, and neighbors Leda and Matt who raise plant starts in greenhouses and trade some of them for cheeses with Timmermeister. As the day of the eight course gourmet dinner approaches, the author gives us detailed descriptions of the activities involved in its preparation from the butchering of the beef to the foraging for chanterelles in the forest, to preparing the soup of Brode Galeax d’Eysines squash and the pickled Long island cheese pumpkin. We meet Tyler a local line cook who comes the day of the feast to aid with the preparations read in detail how he makes pasta. We hear about the arrival of the guests, the serving of the food, and the host’s wish that the guests gained a new appreciation for the ingredients that go into a great dinner. This is a warm cozy read full of rich details The language is simple and easy to read making readers feel like they are part of the scene. Recipes for the feast are included at the end of the book in case you would like to try a feast of your own but without the two years of preparation that were involved in Timmermeister’s. To buy Growing a Feast from Amazon.com Click Here.